We eat a lot of cauliflower in our house (apartment), in fact it is on the menu for dinner tonight along with this salad. As a rule I stay away from white foods such as bread, potatoes, rice, and sugar. They are nutritionally vacant and eating them makes me feel like junk. However, when it comes to white food I make a huge exception for cauliflower. This seemingly innocuous cruciferous white veggie is an anti-inflammatory powerhouse. I love when my veggies have super powers! Up until last week my cauliflower recipe of choice was this one, however after our visit to The Fat Radish my loyalties have changed. I was so inspired by their whole roasted cauliflower dish that I had to create my own version. A note about making pesto. I really have no notes about making pesto. You can't really mess it up so feel free to do your thing with it. Unless ruining it with tons of cheese is your thing in which case I will have to disagree vehemently. But by all means add more garlic, use less lemon, etc. etc. etc. It's all about what tastes good to you. To make the pesto combine all remaining ingredients except olive oil in a food processor. Slowly add the olive oil a little at a time to help things blend. Depending on the consistency you like you may not need to use all of it. Occasionally stop to scrape down the sides of the food processor making sure everything gets well blended. Adjust seasoning to taste, as all measurements are approximate. 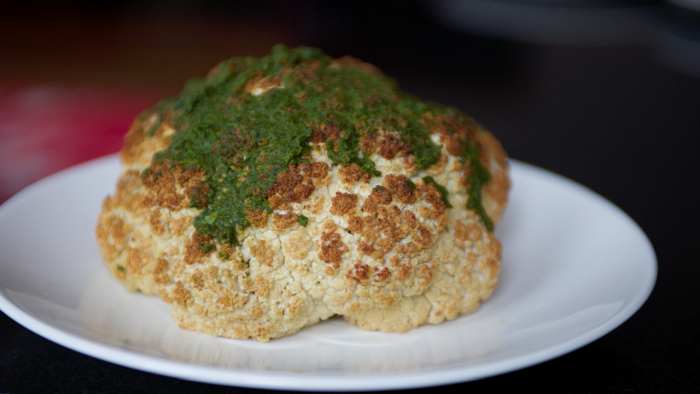 When the cauliflower is roasted, remove from oven and top with a generous portion of the pesto. 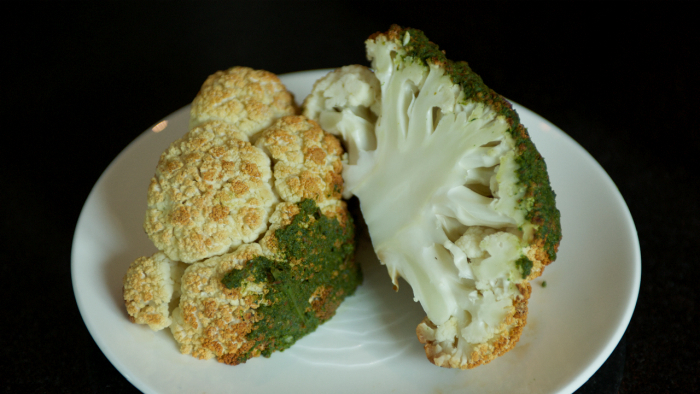 Cut cauliflower head in half and serve. Any remaining pesto can be frozen for future use. Freezing pesto in an ice cube tray is a great way to have pre-portioned servings ready in short order!